Chris England is the acclaimed co author of From Balham to Bollywood, An Evening with Gary Lineker, and the Al Murray Pub Landlord books. Now he brings us the ultimate guide to the 2014 World Cup. It’s the only book you’ll need to see you through the 7,830 minutes of football coming to our screens this summer. It’s also the funniest. 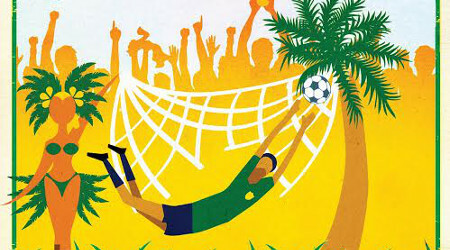 From a full tournament schedule combined with advice on how not to think about Sepp Blatter, to tips on the tricky business of picking a second team (in case England don’t go all the way), whatever your age, whether you’re a fanatic or just an innocent bystander, here’s how to enjoy the greatest carnival of kick-a-ball the world has ever seen. Chris will hosting a Topping & Company World Cup Quiz Night at the Ram in Widcombe. Brazilian beer, soft drinks, music, and prizes for winners and runners up provided by the Ram. Children go free! Adults £7.99, includes a copy of the book and a complimentary drink.